The C & A nines were played in that order with the A side being used for count backs. The yellow markers at 6193 yards were in vogue as the back white tees have the course playing longer than highway one, which circumnavigates the Australian coast line. Prior to tee off one gent commented that his game is to golf what Attila the Hun’s appreciation was of opera and a big turnaround would be required for a podium place. Attila apparently never got his head around opera and nor did the aforementioned gent with respect to his game. 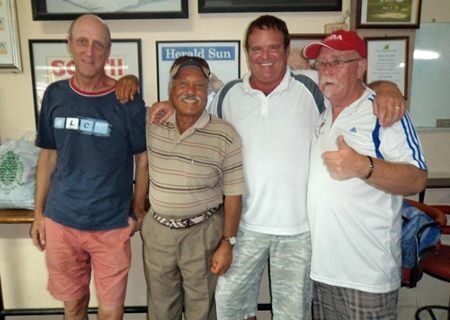 Bill Steinmann, Ebrahim, Mark Henkel and Peter Grey. The starter sent us on our way and the leading group charged down the first like demented water buffaloes in search of a feed. Considering recent rain the course was in good condition whilst the greens were quite slow however putted truly. Welcomes were handed out to John Coetzee from Perth, Western Australia and Bill McGarvie from Ottawa, Canada. We said hoo roo to Ernie Picken who was heading back to Melbourne and Doctor Brian Vale and Wayne Harman returning to Perth. One grade today saw Ebrahim show the way with a stylish forty one points. 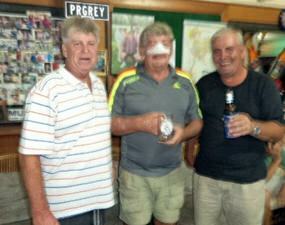 In second place was Bill Steinmann on forty and third was Mark Henkel handing in thirty nine. Fourth, fifth and sixth spots respectively went to Roy Dayton, Bill McGarvie and John Coetzee, while Kae and Alain Taddei rounded out the podium. The NAGA was won by Peter Grey who finished with more zeros on his card than ended up in the Darwin harbour in 1942. Near Pins: Kae A2, John Coetzee A6, The Phantom C3 and Ebrahim C6. Long Putts: Bill McGarvie A9, Alain Taddei C9. Like Argentine ants around the honey pot, a multitude of golfers gathered in Soi Chaiyapoon dusting off their rods in anticipation of another day’s enjoyment. The weather was hot and the course in good condition. Having said that, the greens if you were above the hole were as friendly as a debt collector on a cold Melbourne morning and the short rough looked like Terry Thomas’ moustache on an advanced course of hormone growth. Considering stroke events, the average golfer and good scores are on the same wavelength of compatibility as Rottweilers and nervous postmen, it was no surprise the field struggled. Welcomes were handed out to Rita Zoebelli, J.C.Lhoste and Eddie Kelly. Ron Gillett and Fred Dineley were farewelled. Roy Dayton handed in a gritty net 74 to win the October monthly mug. Martin Kempton meanwhile was like the guy who ate a plate of prunes, got a good run for his money and scored net 74 to win A grade. Second and third were John Davis and Sal Brizzi with net 76s and Stu Rifkin rounded out the podium one shot further in arrears. Gary Monley returned a net 77 to win B grade and was as happy as a termite on Long John Silver’s leg. Second place went to Sandy Leiper on net 80 Lyndsay Slender and Andrew Allen filled the minor podium spots. Bill McGarvie pulled a six iron out of the holster and with a great shot won the near pin on the second with an ace. Well done Bill and thanks for ringing the bell back at the bar. Other near pins went to Gary Monley, Andrew Allen and John Davis. Long first putts saw Mike Gosden roll one in on the ninth and Stu Rifkin on the eighteenth. The NAGA was won by Alain Taddei who indicated his game was not dissimilar to the finesse of an orangutan with a Stradivarius. He received a golf bag as a reward. Note: The Growling Swan caters for and encourages all golfers male or female to have a hit at any of our weekly outings. 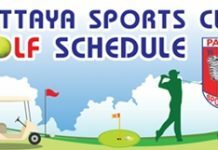 We generally play Mondays and Thursdays at one of the many fine golf courses in and around Pattaya. Please contact Peter Grey if you are interested on 0861 503086. The Growling Swan also caters to the bowls enthusiasts. Bus transport departs the GS on Wednesdays at 10 AM to play at Cocos on undercover synthetic greens and on Sundays at the same time for open grass bowling at The Retreat. Please contact Paul Rennison on 0843 454005 if you wish to partake. The cost including return bus transport, bowling fees and a hot lunch is less than 400 baht so great value for a day out.